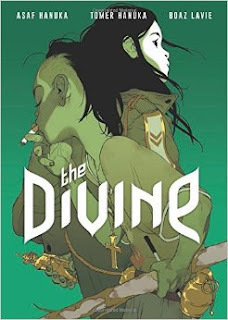 Based on a haunting photograph and a news story out of Asia about two young twin brothers who had become the leaders of a resistance movement, The Divine is a mix of the cliched and the clever. What can't be questioned is the consistently spectacular imagery that brothers Tomer & Asaf Hanuka provide on page after page. In particular, their ability to contrast the natural beauty of the fictional southeast Asian country of "Quanlom" and the grisly, visceral violence on so many of its pages is a remarkable balancing act. All of it looks both beautiful and terrible. It's revolting and riveting, as the reader cannot look away. The story centers around two explosives experts: Mark, a principled man with a pregnant wife and a need for money after being transferred to an undesirable office; and his friend Jason, a hypermasculine, brutal adrenaline junkie. Jason offers him a black ops job in Quanlom to set up explosives to blow up a cave. 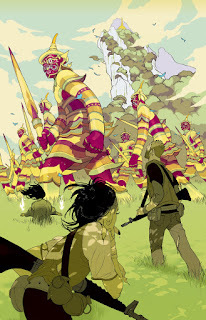 Things get complicated from there, as Mark gets captured by The Divine, two young brothers with powers who claim that the mountain is the home of a dragon. Luke and Thomas smoke cigarettes and lead a group of children who survived their village being massacred by the government. Things get hairier and hairier, as Mark agrees to aid them, only to see the cave exploded by remote. There's a huge confrontation between the children and the military, which later leads to a final conflict between Mark and Jason. The central problem with the book is that one never gets a sense of why the meek Mark and meathead Jason would ever be friends in the first place. Every single one of their interactions is hostile and confrontational. The plot device of the pregnant wife spurring a man into action is as old as the hills. If the creators were trying to show Mark trying to assert his masculinity in a misguided attempt to provide for his family, the way they did it was convoluted and self-contradictory. The key sequence in the beginning of the book is a dream that Mark has where he and his wife are in a chamber that's about to explode, and he can't prevent it. That spurs him to take the job, but that leap felt like little more than a plot device to get to the stuff the authors really found interesting: the boys themselves. The characters of Mark and Jason are little more than a narrative framework to wrap a story around the mystery of the twins, and not an especially compelling framework at that. That said, the sequences with Luke and Thomas are sensational. The action is gripping, the tragedies surrounding them are compelling and the mystery surrounding their claims is especially fascinating--although the reader is clued in right at the start that the dragon is real. A story that truly featured the twins could have been fascinating, but the title and cover characters are pretty much relegated to a supporting status. The resulting book is never less than a joy to look at and marvel at, but in the end it's just so much blood-spattered cotton candy.